There are some gorgeous historic cities to be found all around Thailand, but Chiang Mai is by far one of the very best. Also known as Chiengmai and Chiangmai, Chiang Mai is the biggest city in North Thailand and is the capital of the Chiang Mai Province. Founded on the banks of the Ping River, which is a big tributary of the larger Chao Phraya River, Chiang Mai is home to around 131,000 people, with close to a million in the full metropolitan area. The city has history dating all the way back to the 13th century, but its name ironically translates to 'New City', as it was the brand new capital of the kingdom of Lan Na when it was first founded in 1296. The full name of Chiang Mai is Nopburi Si-Nakhonping Chiangmai, which translates to Chiang Mai, Ping's City of the Nine, in reference to the nine Lannese tribes that once lived in the area surrounding the city. A hugely popular touristic location, Chiang Mai is home to some simply outstanding temples like Doi Suthep, Wat chedi Luang, Wat Phra Singh, and Wat Phra That Doi Suthep. These temples, along with the markets, historic buildings, religious artefacts, and other interesting monuments around the area, make Chiang Mai a wonderful place to visit and explore. The local area is a big hit with backpackers, so you can expect to find several good hostels in the Chiang Mai area. 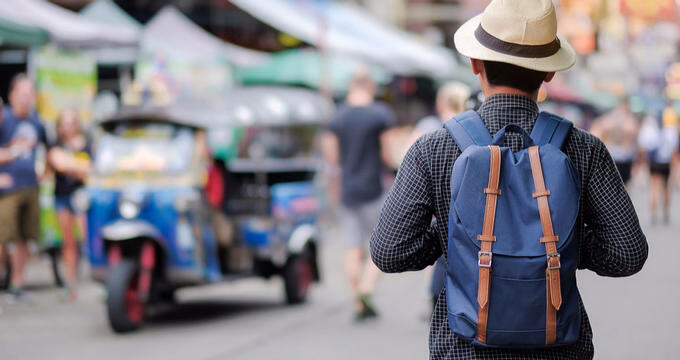 Read on to learn all about some of the most affordable and best hostels in Chiang Mai and start planning your Thailand vacation today. Nicely located on a charming, tree-lined street, the Hostel by Bed is one of the top hostels in all of Chiang Mai and really stands out for its modern style, clean rooms, and great location. Key landmarks and popular touristic sites of interest like the Kad Suan Kaew Night Market, Wat Phra Singh Buddhist temple, Three Kings Monument, and Wat Chiang Man temple are all within walking distance from this hostel, so it's a wonderful place to base yourself for full explorations of the Chiang Mai area. Hostel by Bed features both dorms and private rooms to cater to all kinds of guest. Regardless of the room type you choose, you'll be able to sleep on a comfortable bed with clean facilities and storage solutions for your luggage. Free speedy internet access is provided to all guests throughout the building, with the hostel also benefiting from free breakfasts, clean bathrooms, a communal lounge, and a large kitchen area for meal preparation. If you've spent much time traveling around Asia, you may already be familiar with the Mad Monkey name. Mad Monkey is a popular hostel chain with many locations all around Asia, including this one in the heart of Chiang Mai. This particular hostel is literally right by the Wat Loi Khro temple, with other temples and monuments like the Old City, the Tha Phae Gate, the Chiang Mai Night Bazaar being within walking distance. You'll find both private rooms and chic dorms at this hostel, with the dorms being very nicely laid-out with metal bunk beds and bold storage lockers for guest use. Guests at this hostel can also hang out in the courtyard area, which features a beautiful swimming pool, comfortable chairs, and more. There's also an on-site bar where you can hang out with your friends and get to know other travelers too, along with free Wi-Fi and even a fitness center. Situated up towards the northern side of Chiang Mai, which is where many tourists tend to spend a lot of their time in this Thai city, the Thunder Bird Hostel is another amazing place to stay. The one thing you'll love more than anything else about this Chiang Mai hostel is its low prices; room and dorm rates at Thunder Bird Hostel are incredibly low, so you can stay here very cheaply and visit the local monuments with ease. The Thunder Bird Hostel is within walking distance of several world class historic temples and historic monuments, with the hostel itself featuring clean, spacious dorms with simple, industrial-style bunk beds laid out in a neat and orderly fashion. The hostel is beautifully decorated with clean white walls, lots of plants, and some interesting artwork too. It features free breakfasts, a cafe/bar, a restaurant, free Wi-Fi access for all guests, and friendly staff who are always ready, willing, and able to help you make the most of your stay.